A brilliant recording of my favorite opera. La Boheme is one of the world’s most accessible operas for beginners. Nowadays, when opera is widely regarded as some sort of snobby, elitist thing, it’s easy to forget that 100 years ago opera composers and stars were the rock stars of their day. 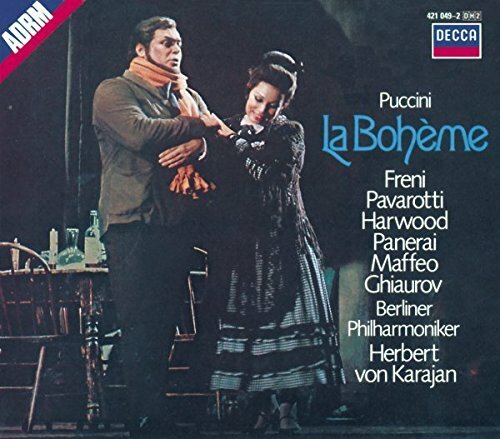 Puccini was one of the biggest, and when listening to La Boheme, it’s easy to see why. Seriously, every damn tune in the whole opera is hummable. Like most great operas, La Boheme is a blend of the ridiculous (she’s dying of tuberculosis and she sings like THAT?) and the sublime. This particular album reaches more towards the sublime. Although Pavarotti wasn’t my favorite tenor, his voice blends beautifully with that of Mirella Freni as Mimi and Rolando Panerai as Marcello. The other performances are also top-notch.